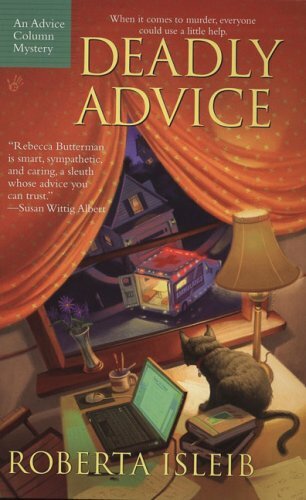 From the back cover: "As a clinical psychologist and author of an online advice column, Dr. Rebecca Butterman is supposed to help people resolve their internal conflicts - not stir up her own. But when trouble strikes very close to home, Rebecca's investigative instincts make it hard for her to maintain appropriate boundaries..."
I liked this one. Would like to read more in this series. Placed into my Recent Mysteries Bookbox. Released for week #21(a pen, pencil, etc.-in the cup on the table near the computer on the front cover)for the Never Judge a Book By Its Cover release challenge. This book is now on its way to affinity4books, who chose it from the bookbox. Enjoy! Received in the mail today. Looking forward to this new series! I can't wait to read more in this series. Psychology is my field so I loved all the bits about Rebecca's professional life sprinkled in. The villan was hard to spot and the main character was likable and realistic. Thanks for sharing this one! I read it on the plane ride home from a trip to Seattle. affinity4books passed this book to me. It looks good. I always enjoy "phychological suspense" and plan to put this one on the top of my tbr pile. A fellow bookcrosser read and enjoyed this book...I just couln't get interested in it! "To each his own"